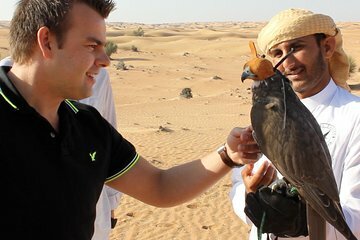 Try your hand at falconry on a private tour within the Dubai desert. Set out in the early morning to the Dubai Desert Conservation Reserve, located amid the emirates' vast sand dunes. Learn about the region and its wildlife, then enjoy a hands-on falconry experience with guidance from a professional trainer. Feed a bird of prey and marvel as it returns to your gloved hand, and discover a variety of training techniques ranging from age-old tactics to remote-controlled drones. Upgrade with an optional post-falconry breakfast at Al Maha Desert Resort. A falconry session for just you and your party, and with your own qualified falconer, makes this a stand-out. This was one of the most excellent adventures we have ever done!! Flying the birds was such a treat and our falconner Brian was wonderful. We learned about the sport and the birds. I highly recommend this excursion. 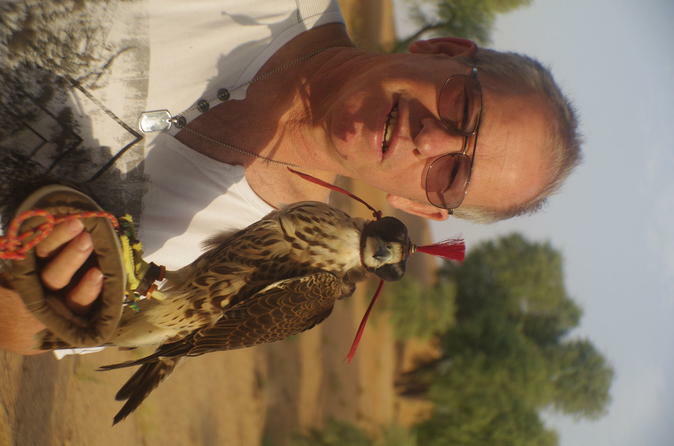 I had never done Falconry before and I am so glad I picked Royal Shaheen for this, the falconer Henrik was very knowledgeable about the birds. There were 5 in total, 2 falcons, 1 Owl, 1 Hawk and an Eagle. Each one was good but my favourites were the Owl and the Eagle. The early morning start was well worth it. It was just the 3 of us and the 5 birds out in the desert. I would recommend this activity as it was well organised. It is one of the best things I have ever done. Very pleased to have chosen this tour. A very well organised operator and excellent value for money. We chose the additional breakfast option and this added to the quality of the product. Interesting, amusing, relaxed timings, very knowledgable staff along with spectacular birds made this tour the highlight of our 5 days in Dubai. Highly recommended. This tour was amazing and a memory for life. Worth its money definetly. We got to interact with the birds and have them fly to us to pick up food from our hands. The two South african guys who had the tour had so much knowledge and passion for the birds. Highly recommend it. Fantastic experience..we were able to work with five different birds...the drive out was beautiful...the breakfast at the gorgeous desert hotel was delicious...saw a lot of wildlife on the drive...best experience we had in Dubai...the guides, Werner and Rabin were exceptional. If we return to Dubai we will do it again! What an experience, it was amazing and would recommend to everyone! From the minute we were picked up from our hotel to the drop off at the end of tour, we enjoyed the trip. Our personal guide was friendly and welcoming from the start, the company in the jeep was amazing - Dave the Kestrel and Khaimah the eagle. What a surprise to be travelling with these beautiful birds from the get go. The talk, demonstration, flying and interaction with all the birds was so exciting and the amount of information I learnt was great. We opted for the breakfast which as lovely, to sit in the desert at a luxury hotel was a nice way to relax and eat in the middle of the tour. It was worth the money, we had such a feast! We finished off the tour with a visit to the Falcon center and again was very interesting. If you like birds of prey, getting up close to them and learning more, this tour is for you. Enjoy. It was a fantastic tour and I highly recommend it. Thank you to Erin and the team for a great morning out learning about the birds and the training they do. It's a great way to discover more about Dubai. The breakfast was delicious and the view of the desert country was amazing.